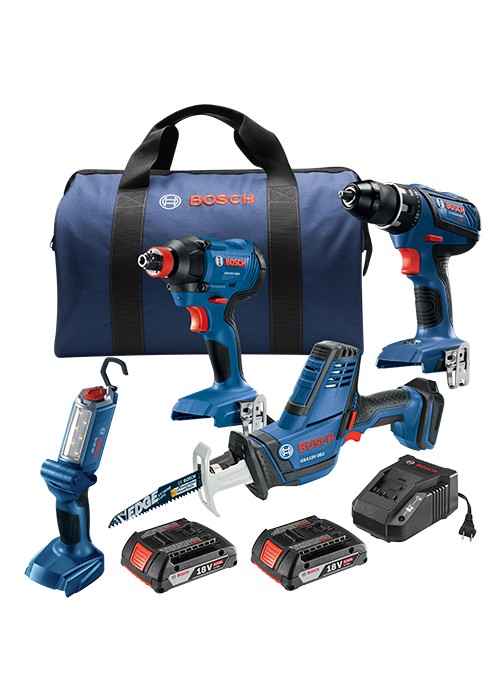 The Bosch GXL18 V-496B22 18 V Cordless Four-Tool Kit is a convenient way to get into Bosch's 18 V platform. The GDX18 V-1600 Freak two-in-one bit/socket impact driver’s chuck is a 1/4 In. quick-change hex shank with power groove for bits and 1/2 In. square drive for sockets. It produces up to 1,600 In.-Lbs. of torque and up to 0-3,600 blasts per minute. The DDS181A Drill/Driver features a compact motor with the same power as conventional 18 V motors at a lighter weight. It produces 600 In.-Lbs. max torque. The GSA18 V-083 Reciprocating Saw is 15-3/4 In. long and only 4.4 Lbs. (tool only), but it delivers 0-3,050 strokes per minute. The GLI18 V-300 is a bright light with 300 minutes of runtime per amp hour. The kit comes with two 18 V 2.0 Ah SlimPack batteries and a charger.